Although April 30th may seem like an eternity away for many park lovers, that doesn't mean that construction isn't continuing at a feverish pace in the Coney Mall section of Kings Island. In 2011, Kings Island will present WindSeeker - an all-new 301' swinging thrill ride - to the masses, but it doesn’t stop there. In line with Cedar Fair’s commitment to improving the over all look and feel of the park, the entire Coney Mall section of the park is getting some much-needed attention. Gone are the days when park patrons will walk through Coney Mall on the dreaded blacktop surface. This spring, you will see very classy-looking brick pavers line the walkways similar to the entrance to the park, which was renovated a few years back. KICentral was invited into the park for an exclusive tour to see how things are progressing. Much of Coney Mall looks great now, while other areas are still a work in progress. Oh yeah – and WindSeeker seems like it’s just dying to go vertical! Thanks for the update Ryan! Those new pavers make a huge difference! Any further indication as to when WindSeeker is going vertical? It's great that they're changing to the pavers. It will improve the KI experience greatly, I'm sure. Aesthetics are very important, and KI has always lived up to my visual expectations. One thing is still missing (for me at least). Does anyone know if there's any information on whether they plan to change the background music played throughout the park this year? (I hate to beat a dead horse, but asking once a year is not too much, I hope.) I've asked CR, but all I've gotten are form letters. Anyway, I'm happy to see the changes taking place there in CM. It looks like a lot of great planning went into it. Thanks for the update! I was pretty excited to see this post after I got that text message. my favorite time to see pictures of the park is when everything is covered in snow and/or in rehab. *thought i'd add, in the picture of shake, rattle, and roll, you said it was the monster. Coney Mall, in my opinion, has been a very neglected section of Kings Island for quite sometime now. Its great to see them putting a great deal of work into an area with such potential! I can't wait until WindSeeker starts going vertical! Maybe the "depressing, abandoned food stand" will come back to life again!! Looking great so far. Thanks for the update and photos. That caption has been fixed to properly reflect the attraction shown in the image. Wow, Coney Mall looks a lot better with the brick path. I can't wait to see the finished WindSeeker! The skyline will be changed forever. This new ride will certainly anchor the end of Coney Mall, and offer some unique views of The Beast, Vortex, and Racer. Great pics Ryan, and thanks to KI for the exclusive tour! It is so very good to see the asphalt disappearing little by little as the years go by. Can't wait to see and walk on those new pavers. It is going to make CM look so much nicer! It should also be much, much cooler in those lazy, crazy, hazy days of summer! Ryan, Thanks for the pics. CM looks great! The vertical build up would really be fun to watch. Wow those pavers look really really nice! Should make for a nice cool little area. In more ways than one! Looks like that bathroom might be getting some love as well. Hopefully it gets a complete overhaul like the bathroom in Planet Snoopy did in '06 (next to Sally's Sea Plane) instead of the "cosmetic upgrade" its conjoined twin received in '09 (facing Diamondback). Although I wouldn't mind having all the restrooms in the park with those hand dryers. I would. I HATE, HATE, HATE Dyson driers. So much so that I would think seven times before even looking at a Dyson vacuum cleaner. Not sanitary (in my opinion, though for some reason the NSF does not agree), don't work very well (at least for me)...must have cost less than Xlerators, the gold standard in hand drying (though noisy!). Dyson? Can you say Malaysia? Why did they put Wind Seeker right in the middle of the pathway? Why are there some games buildings right in the middle of the pathway? Why did there used to be tree planters right in the middle of the Coney Mall midway? Sometimes there are valid reasons for decisions. Just think how seeing WindSeeker terminating the Coney Mall axis will look when you stroll down Coney Mall. Ok, enough with the architecture speak. It will definitely look better than the area used to look, when it was essentially just an exit area, and the entrance for the seldom ridden FX Theater. with the way things look on the webcam, so they wouldn't need to "RE"-route for fx theater entry exit way. had they put it inbetween fx theater & Vortex like i thought. that would have required @ least the exit to be re-routed. The only thing I'm concerned about is the amount of space between the ride and the path. But who knows what they are thinking! ( some do ). It will all work out! Looks like they pulled a MaxAire just jamming the ride where ever it was easiest to fit. It might grow on me Im not sure buts it wouldn't be my first pick to put the ride. Why not? It's sure to be beautiful as a towering landmark (or as Mr. Disney would say, a "weenie") at the far end of the Coney Mall area. It's also continued Cedar Fair's pattern of adding a new ride to an area of the park, and renovating that area in turn. 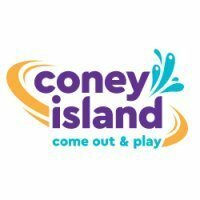 First Rivertown, then Planet Snoopy, and now Coney Mall. Thematically (though I don't imagine this was necessarily their intention), the idea of a turbo-charged yo-yo swing fits very, very well with the idea of the Coney Mall area. A new take on a classic ride. And it's placed such that it'll provide a great view of the entire park in one glance, and a lot of wilderness with another. I think it's great, and will liven up that area of the park. My prediction on how the area will look. TOPGUN1993 I think your right. That's a great prediction! Fish shrieking with joy? The mind...boggles! Or perhaps it was the roller coasters shrieking with lack of grease...oh, wait...that's at The Finest Theme Park In New Jersey (I hear the.....rolling thunder)! I agree with Paul on this one, except I have a question of one thing, isn't it going to be a little jammed with all 3 exits coming together at one point?